Today, I will translate my award winning sushi recipe which I won the outstanding performance award at "sushi project" by iCommons Summit'08 in Sapporo. 1. Cook rice and place in a bowl. Add A while the rice is hot and slice through rice using rice paddle to separate the grains. Will use moderate amount. 3. Mix the chopped pulp (2.) and B. 4. 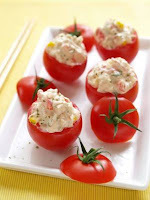 Stuff moderate amount of sushi rice into tomatoes, place the tuna mixture (3.) on top, and sprinkle parsley flakes. Last time I said I was interviewed by Hana TV, and the copy of the broadcast (on August 6th) has arrived few weeks ago! I forgot to mention it in my blog. My speech wasn't that good but it is a good memento!!! The gym is closed today (it is closed every 10th and 26th), so I went to see my dentist for cleaning/check-up! Am I keeping myself busy? !